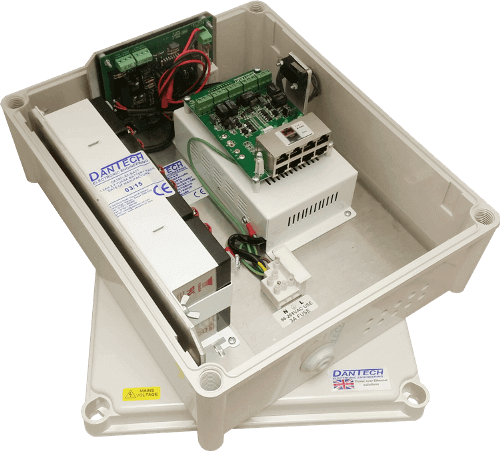 All Dantech SecurePoE products feature a secure enclosure with all connections inside. They include status monitoring and tamper contacts that can be used in a variety of ways to increase system security. 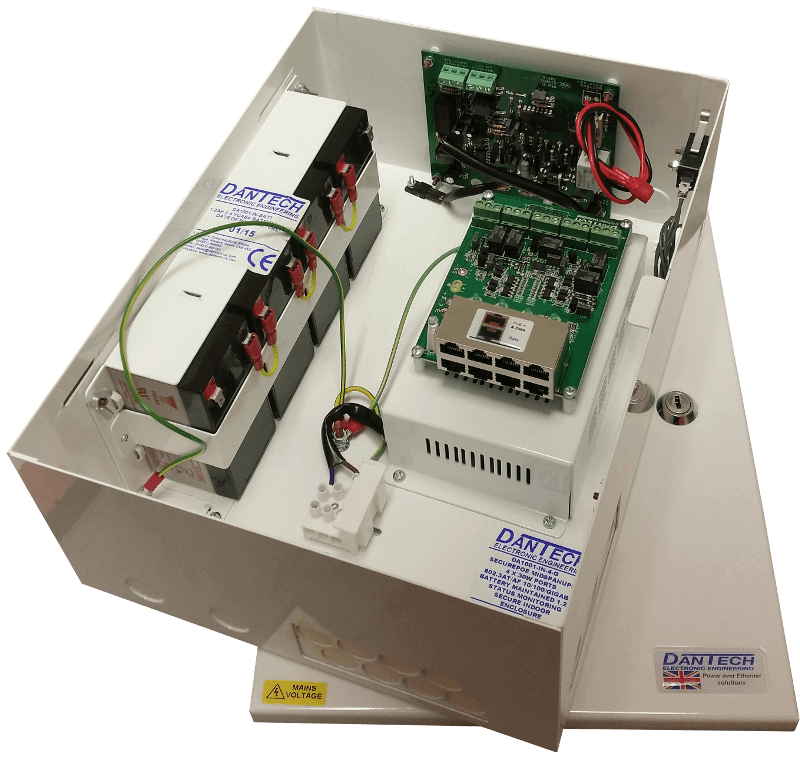 Manufactured and tested in Great Britain, Dantech SecurePoE products use British designed high efficiency and high reliability electronics. Products are compliant with IEEE 802.3:2012 (802.3at, 802.3af) and designed for use with all compatible load devices. MidspanUPS & MultispanUPS products include replaceable stand-by battery packs with Yuasa batteries. There are versions for both long and short stand-by durations available. Designed for reliable battery backup of PoE devices, our SecurePoE™ range includes battery maintained MidspanUPS and MultispanUPS models that provide continuous power to PoE ports when mains power is not available. The MultispanUPS models maintain power to both the SecurePoE unit and the included Cisco network switch. Power backup is provided by our replaceable customised battery packs, which use high reliability Yuasa batteries. Different capacities are available to cater for different standby time requirements and we offer guaranteed replacement battery pack availability. Whether powering CCTV cameras, video intercoms, locks or other device types, Power over Ethernet battery standby is available off-the-shelf. Indoor SecurePoE MidspanUPS is ideal for indoor environments where up to four devices require reliable, PoE power up to 30W each. With one, two or four through-port models available, you can connect devices to be powered with or without a data connection. Battery backed options of 1.2Ah, 7Ah or 10Ah of battery back-up, ideal for maintaining power during mains power faults and fluctuations. Exterior MidspanUPS SecurePoE is ideal for harsh outdoor environments where up to four devices require up to 30W each of reliable PoE power. With one, two or four through-port models available, you can connect devices to be powered with or without a data connection. 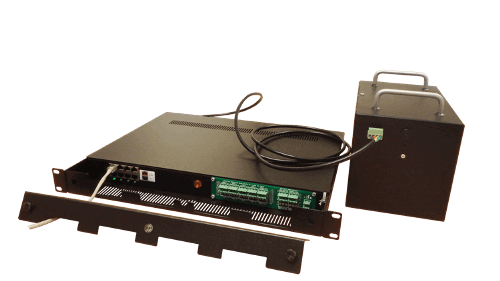 SecurePoE Midspan is also available in 1U Rack mount enclosures which are ideal for where rack space is limited and battery backed or monitored PoE power is required. With four or eight through-port models available, you can connect devices to be powered with or without a data connection. Benchmark magazine, the publication dedicated to innovation in the security sector, has announced that Dantech’s SecurePoE technology has been nominated and selected as a Finalist in the Infrastructure category of the Benchmark Innovation Awards 2016. Judged by the Benchmark test team and industry professionals, the Awards criteria recognises products that enhance and advance the delivery of secure, flexible and beneficial solutions; rewarding innovative thinking in the delivery of benefits through those advanced security solutions. PoE Plus equipment has a power class of 4. If a regular 802.3af PoE source detects this class it will simply deliver power as if it were a class 0 device. However, 802.3at power sourcing equipment will not only recognise the powered device as a PoE Plus device, it will also repeat the classification stage as a signal to the powered device that it is connected to a power source with full PoE Plus power available. PoE Plus power sourcing equipment, such as SecurePoE, can supply up to 30 watts. This is so equipment, even with cable volt drop over 100m, will recieve the full 25.5W they may need. SecurePoE also has no power budget and can supply up to 30 watts to all connected devices simultaneously. 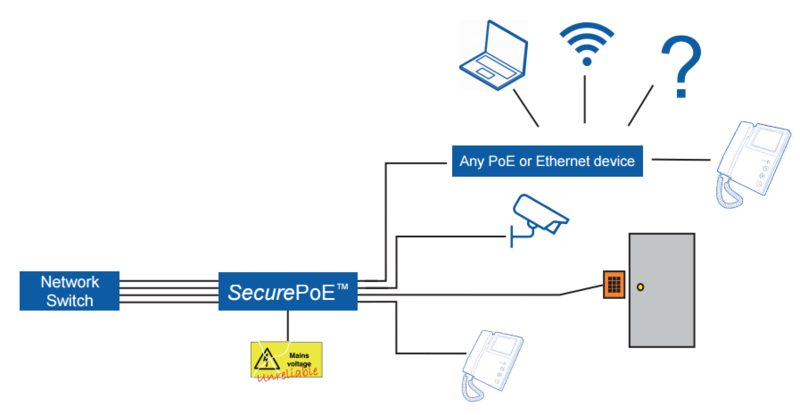 SecurePoE provides poe power over Ethernet for power over Ethernet devices such as: power over Ethernet camera, power over Ethernet voip, power over Ethernet lighting, power over Ethernet access point, power over Ethernet security camera, power over Ethernet router, power over Ethernet surveillance system and much more.